…to unpack and settle at home and in the studio for a while. “Beach Plums”??? Have you heard that term before? If you live along the beaches of Massachusetts you know that the image above is depicting just that, Beach Plums. On the prairies we call the fruit of the Wildrose (Alberta’s provincial flower) Rosehips. This trip has proven to be very educational! Only a week ago I left the Plymouth region for Manchester. I arrived home last night and spent the better part of my morning downloading close to 2,000 images. Here are just a few to summarize the fantastic time I enjoyed before heading to “work”. 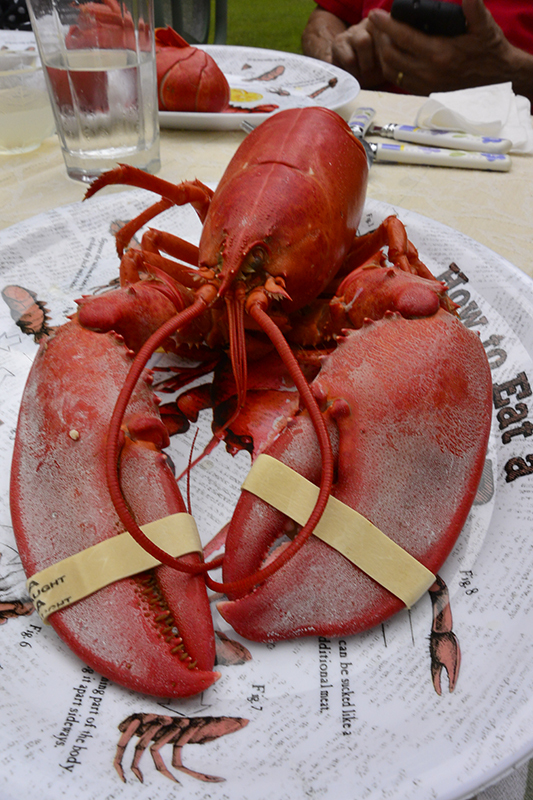 Thanks to Glenna and Glenn for the delicious Lobster dinner with Chowder, Steamer Clams and fresh Peaches and Cream Corn. What a great welcome to the East Coast! Marlene’s dessert, a scrumptious Carrot Cake rounded up the great food that night… I choose not to talk about the calories – the food was just too good to be missed. Glenna and I spent part of the afternoon navigating the breakwater at Plymouth Harbor. We walked all the way to the end and back, 1.5 miles total in glorious sunshine. You know me: I love the views but I always look for the details for extra inspiration! These poles holding in cables as hand rails drew me in. Just look at the interesting rust formations on the metal that is exposed to the elements year-round. …the August Super Moon rose over Plymouth Peninsula in the east. 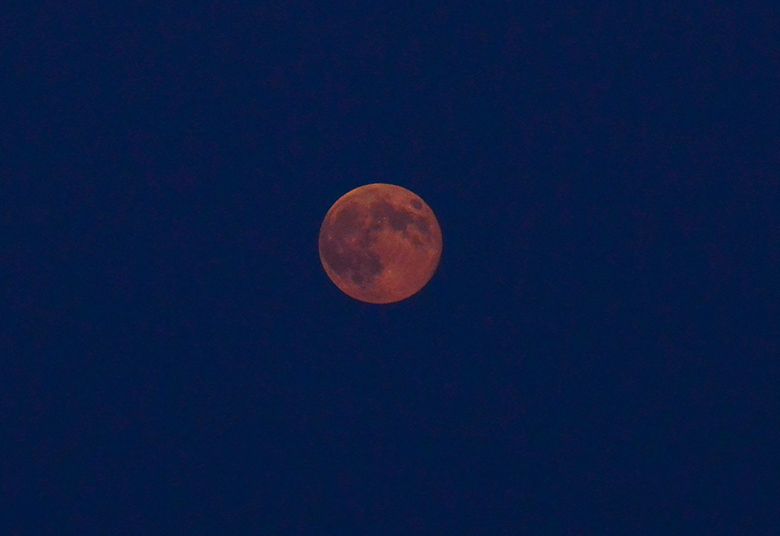 Orange, full and unobstructed this moon was one not to be missed. What better place to witness the phenomena than while cruising the Atlantic Coast just off Plymouth, Massachusetts? With so many great memories and impressions my photo files are bursting with inspiration. Today is a day for unpacking and regrouping. Hope you enjoyed my little walk down memory lane! 19 Aug	This entry was published on August 19, 2014 at 10:55 am. 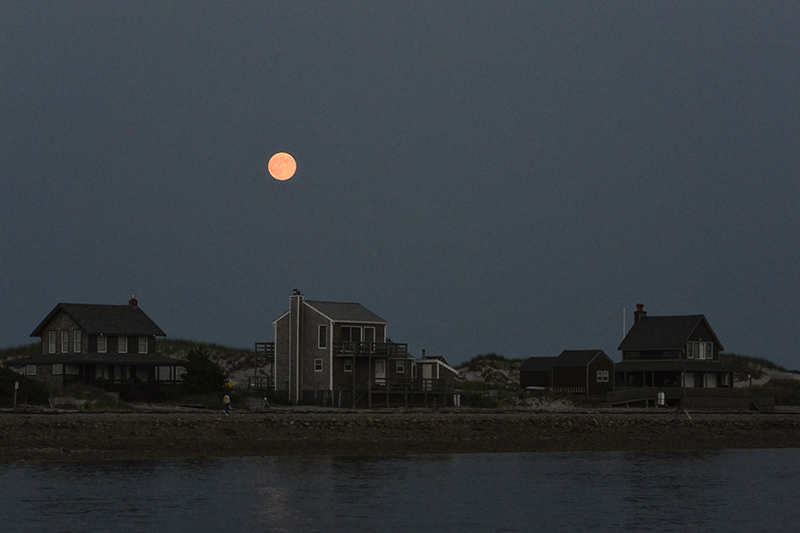 It’s filed under Art, Creativity Update, Journaling, Nature photography, Nature's Art, Photography & Events, Travel and tagged Beach Plum = Rosehip, lobster dinner, Plymouth Harbor, Sunset over the Atlantic, Super Moon - August 2014. Bookmark the permalink. Follow any comments here with the RSS feed for this post. It’s always good to come home, Donna! Off to Calgary for the early part of September, then home for a few days and off again to Montana and California till late October, Leona. We are driving and camping – should get lots of photo ops. The Cactus was painted and the thorns were stitched with metallic thread with ends about 1/2 inch long. What a wonderful experience! I would love to visit that area some day. Beautiful Anna. I can feel it with your gorgeous photography and descriptions! !